Wits EFF forced their way into a Wits University dining hall yesterday evening in order to take food for needy students. Some members of the Wits Economic Freedom Fighters (EFF) stormed their way into the Wits Main dining hall on Thursday evening, demanding food for hungry students. “That food needs to be given to students not thrown away or kept by Royal Mnandi on top of the profit they are making,” said Mbe Mbele, coordinator of the WitsEFF. Royal Mnandi is one of the catering services on campus. According to the organisation, many students have been contacting them, asking for help with regards to food and accommodation. “Students are hungry,” they chanted. 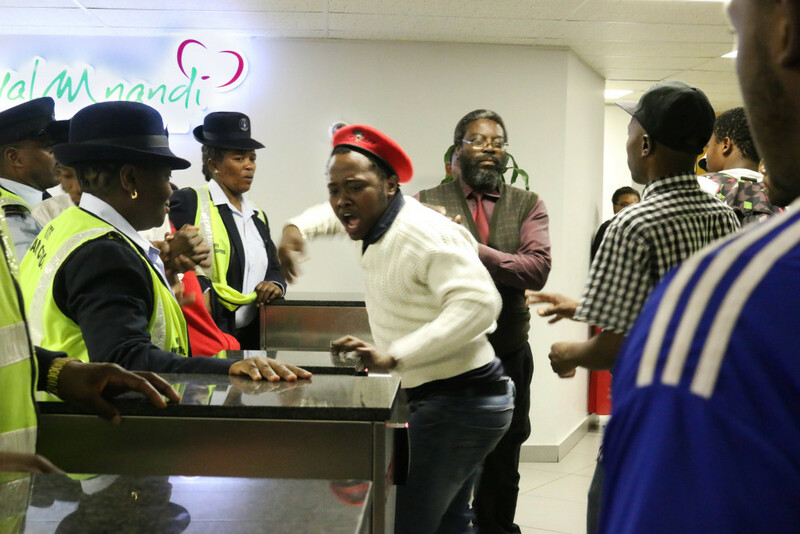 The party members, wearing their disctinctive red berets, forced their way into the main dining hall, pushing campus control security guards out of the way and demanded food from Wits Student Liaison Officer, Bontle Mogapi. The students were adamant that if their demands were not met, they were going to jump into Royal Mnandi and serve hungry students themselves. “We are going to relieve these mothers and fathers, who are paid peanuts of their work, we are going to serve students on their behalf,” said Mbhele. Vuyani Pambo, chairperson of Wits EFF, told Wits Vuvuzela that they requested at least 20 meals to feed needy students for the night and the dining hall management refused. Wits EFF then took it upon themselves to provide the students with food. Tebogo Mabeso of the Wits EFF told Wits Vuvuzela that there are students who book meals at the dining hall but end up not collecting them. These meals still get billed whether or not they are collected. The Wits EFF say these meals must be given to needy students. “What you see here is a demonstration of black rage,” said Pambo. The Wits EFF are calling for all students in their respective faculties to reflect critically and make radical strides towards giving the university a “black face”. According to the Wits Deputy Director of Retail and Catering, Nicholas Matthes the Wits EFF members did not follow the correct procedure in dealing with this matter. “Students need to approach the Dean of students,” he said. Mogapi refused to speak to Wits Vuvuzela and said she did not understand what the Wits EFF was demanding.